The Boxtrolls: Is Laika Entertainment the new Pixar? His name’s on the box! Eggs prepares to lead his tribe in The Boxtrolls. Just in time for the start of autumn comes The Boxtrolls, the first good mainstream movie of the season or indeed in what feels like ages. Of course, this stop-motion film is made by the excellent animation studio Laika Entertainment, so it’s hardly surprising that the movie turns out well. This is the company’s third movie after Coraline and ParaNorman, and so far they haven’t put a foot wrong. 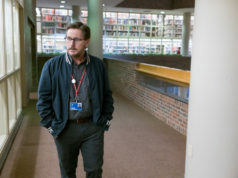 The current film may not have the same depths as its predecessors, but it’s still a great option, especially in light of what else is in our theaters right now. Based loosely on Alan Snow’s children’s book Here Be Monsters!, the movie takes its title from a race of gibberish-speaking creatures who live in a cavern under the streets of a topographically strange place called Cheesebridge. Only coming out late at night so they can steal little bits of metal and clockwork, the boxtrolls are harmless, but unscrupulous entrepreneur Archibald Snatcher (voiced by an aurally unrecognizable Ben Kingsley) accuses them of stealing a human boy and vows to eradicate them. 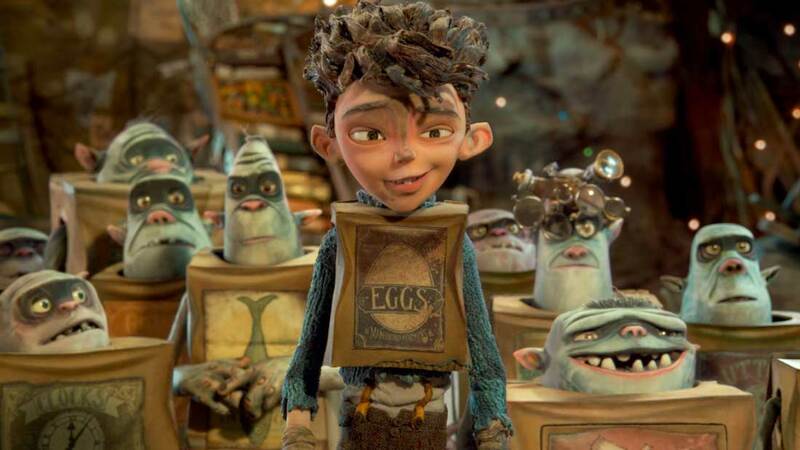 The boxtrolls are indeed harboring a boy, naming him Eggs (voiced by Isaac Hempstead Wright) — like the rest of the trolls, Eggs is named after the word that’s on the cardboard box that he wears. Once Eggs realizes what’s happening to his friends aboveground, he decides he must establish peaceful coexistence between the trolls and the humans. Just as with Laika’s other two films, there’s a lot going on with the plot. Cheesebridge’s white-hatted ruling elite is so obsessed with cheese that they applaud their ruler, Lord Portley-Rind (voiced by Jared Harris), when he uses the funds intended for a children’s hospital to make a gigantic wheel of cheese that he calls “the Brie-hemoth.” Meanwhile, the red-hatted Snatcher undertakes his crusade against the boxtrolls because he’s hellbent on forcing his way into the white hats’ crowd and eating cheese with them, even though he’s gruesomely lactose intolerant. This is revealed early on in a great, disgusting gag when we see what happens to Snatcher when he actually eats cheese — what fun it must have been for the animators to come up with this! These developments are beautifully fleshed out by writers Irena Brignull and Adam Pava, who bring sophisticated wit to this kids’ movie. One example of this is a delightful running philosophical conversation between two of Snatcher’s dimwitted minions (voiced by Richard Ayoade and Nick Frost). After hearing the trolls denounced as bloodthirsty animals, one henchman asks the other, “Do you think the boxtrolls understand the duality of good and evil?” There’s also some good character work in Lord Portley-Rind’s attention-starved daughter Winnie (voiced with great relish by Elle Fanning), whose severely morbid streak leads her to seek out the boxtrolls. When she sees their lair for the first time, she’s pissed: “Where are the rivers of blood? I was promised mountains of bones!” These characters’ vividness has the unfortunate effect of making Eggs look dull by comparison, but that doesn’t harm the movie too much. For their part, directors Graham Annable and Anthony Stacchi engineer a number of complicated action sequences that manage to unfold naturally, like the one in which Eggs tries to bust one of the trolls out of Snatcher’s prison. Even a seemingly straightforward sequence with Eggs and Winnie trying to make their way across a dance floor at a formal ball is dazzlingly executed. If you’re a fan of steampunk, you’ll be enthralled by the look of this movie, combining 18th-century powdered wigs and corsets with heavy machinery. Even the littlest details here tend to sing — literally. Eric Idle pens Snatcher’s song about the evilness of the boxtrolls, while composer Dario Marianelli comes up with an Italian barbershop quartet number whose lyrics consist solely of the names of cheeses. Eggs’ attempts to integrate himself into human society don’t illuminate anything of note, and the intrigue between Cheesebridge’s white hats and red hats doesn’t quite add up to a statement about power and what people will do to get it. All told, The Boxtrolls doesn’t have the dark streaks that won such devoted followings for both Coraline and ParaNorman. 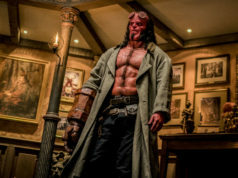 Yet it’s precisely that lack of darkness — as well as the movie’s prestigious late-September release date — that will probably make it more appealing to filmgoers who don’t want their kids to be overly disturbed. They’ll find an excellent light piece of entertainment here, and the resourcefulness, inventiveness, and high quality of Laika’s animation richly deserves a wide audience. Voices by Isaac Hempstead Wright and Elle Fanning. Directed by Graham Annable and Anthony Stacchi. Written by Irena Brignull and Adam Pava, based on Alan Snow’s novel. Rated PG.